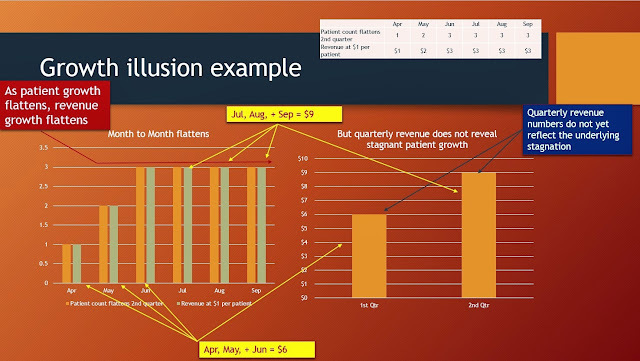 Aegerion’s “acceleration” in patient count does not add up. In fact, its third quarter revenue is more consistent with flat patient growth. Is this why Aegerion suddenly stopped revealing patient counts last quarter? This only adds more suspicion to Aegerion. As demonstrated in my previous article, “Estimates of Aegerion’s addressable market at odds by 1,000%,” the company’s CEO has been promoting a US HoFH population of 3,000, while the very scientists associated with Aegerion put the number at 300. Even a Nobel Prize winner put the number at 300, in his acceptance speech. And now we have new questions surrounding the number of patients on therapy. 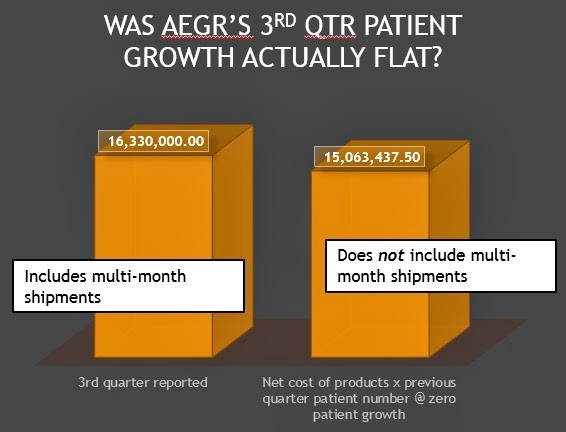 Calculating AEGR’s revenue at zero patient growth and then accounting for multi-month shipments yields a total roughly equal to AEGR’s actual reported revenue, suggesting that there was no growth in patients for the 3rd quarter. “Patients on therapy” presumes receipt of the drug and therefore, revenue recognition. 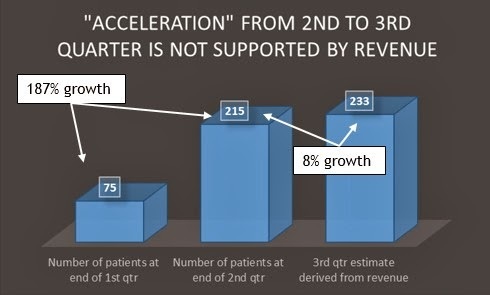 So an estimate of minimum 3rd quarter revenue at zero growth in the patient count should come in at 215 X $70,000 = $15 million ($295,000, quarterly, at 5% gross-to-net). Multi-month shipments have not been factored in. For example, our minimum revenue estimate would be larger if Aegerion revealed the percentage of international sales, “many” of which were multi-month shipments. 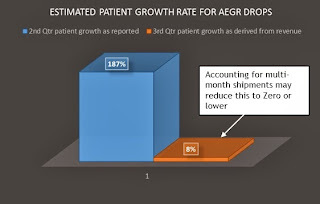 Critical point: At zero patient growth, we calculate Aegerion’s revenue to be $15 million. After we add in multi-month shipments the total is even closer to, if not exceeding, the actual reported revenue of $16.3 million. 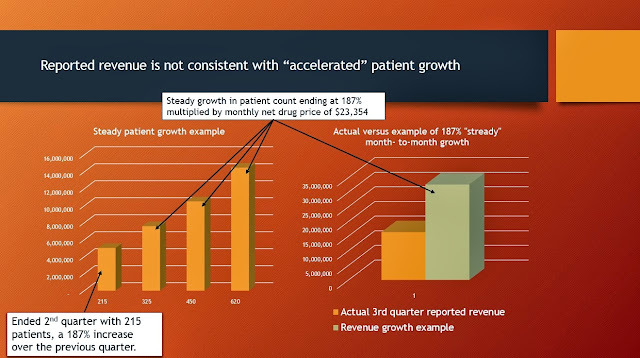 Thus, reported revenue does not support Aegerion’s claim of “accelerating” patient growth. 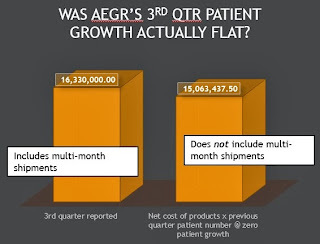 In fact we must ask, Was Aegerion’s patient “growth” actually flat – or even negative? From 75 to 215 patients we have 187% growth. So how many patients would we now have in the third quarter if the patient count were indeed accelerating? One cannot reasonably apply such a growth rate into the third quarter and reconcile the outcome with reported revenue. For example, we could try to simulate Aegerion’s patient growth, multiplied by the net price of the drug, and then compare that with Aegerion’s actual reported revenue. But even zero growth from the second to the third quarter is difficult. For the metrics to account for Aegerion’s revenue we would need to estimate fewer patients, but this would instantly bring our “growth rate” down from an acceleration to a deceleration. How few patients would it take to approximate Aegerion’s reported revenue? Let’s take the minimum patient growth – zero – and see how that compares. Third quarter revenue came in at $16.3 million. If we took the second quarter’s patient count, assigning zero growth for the third quarter, and multiplied that fixed patient count by the net price of the drug, we would arrive at $15 million. Aegerion is no longer revealing patient counts. Have we found the reason why? 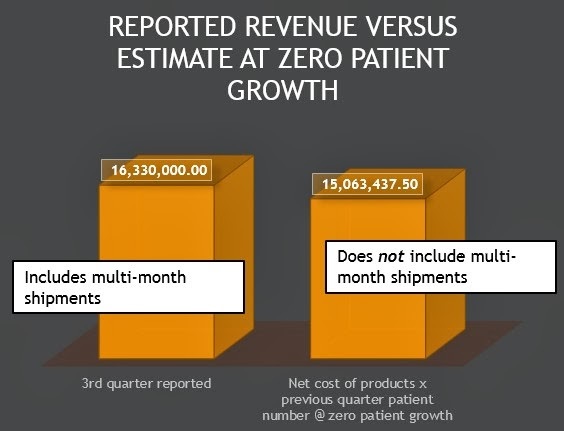 The slight gap between this estimate and reported third quarter revenue could easily be closed if we were given the number of multiple-month shipments (more on this point later) so in this example, we not only ask if patient growth accelerated, or even decelerated, but whether it even grew at all. That was an effort to compare stated revenue with what revenue would look like if there were zero patient growth. We could flip the equation on its head and begin with revenue, divide by the cost of the product and then compare growth rates among the quarters. “Acceleration”? To best 187% by a single percent, 188%, we would estimate about 620 patients at the end of the third quarter, and we would have to show an increase in revenue commensurate with adding 400 patients to therapy. By any reasonable scenario, such revenue for the quarter is clearly not there. 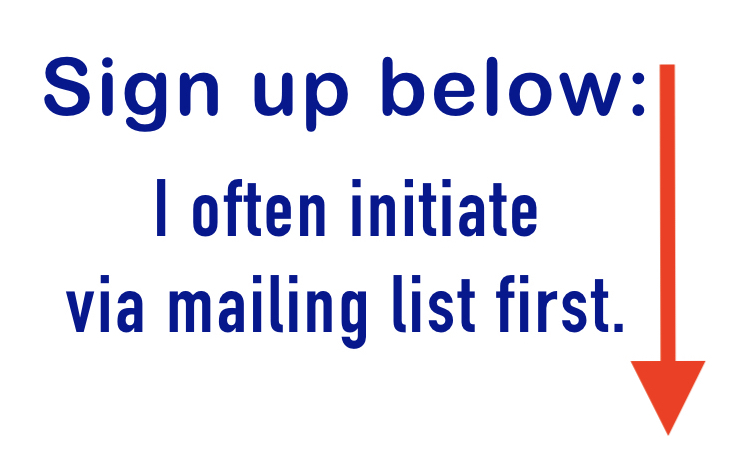 What minimum number would I assign to “multiple-month” shipments given the words, “in many cases”? Aegerion is not providing clarity or giving us patient counts, so I have decided to leave this estimate out and give Aegerion the best possible footing. But that number is certainly not zero. Mark J. Fitzpatrick: "Yes, Salveen, the multiple-month shipments are in no way returnable. Title is transferred to the end customer. So we recognized fully the revenue on those multiple-month shipments when that product is received at the other end." Again, the greater the number of multi-month shipments the fewer the patients on therapy that we can derive from revenue. This threatens the prospect of Aegerion’s having any patient growth at all. In fact, if one estimates so little as 20 patients with multi-month shipments, the estimated total patient count could actually decrease from the previous quarter. We would be travelling in reverse and could not even speak of a deceleration. Perhaps all this can be resolved by delving into how Aegerion recognizes revenue? 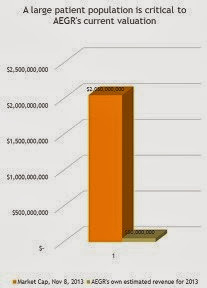 "Revenue from sales in the U.S. is generally recognized once the product has been received by the patient. For uninsured amounts billed directly to the patient, revenue is recognized at the time of cash receipt as collectability is not reasonably assured at the time the product is received. To the extent amounts are billed in advance of delivery to the patient, the Company will defer revenue until delivery occurs." Presumably if patients are “on therapy” then the drug had been shipped to them. The second quarter conference call left a very clear picture. Steve Byrne - BofA Merrill Lynch, Research Division: "And would the 215 patients that are on drug, does that metric include patients that have been denied coverage, or are these all reimbursed patients?" Marc D. Beer - Chief Executive Officer and Director: "No, those, Steve, are patients on therapy, and we don't ship until pre-office approves. So those are approved insurance on therapy patients." And we can’t be saying that “patients on therapy” is the same as patients receiving prescriptions, leaving room to claim a “lag” in revenue where we begin counting patients at the writing of the prescription: Aegerion draws a clear distinction between the two in the third quarter conference call. From a quarter to quarter perspective we see Aegerion’s revenue grow from about $6.5 million to $16.3 million. Rather impressive … maybe … maybe not. 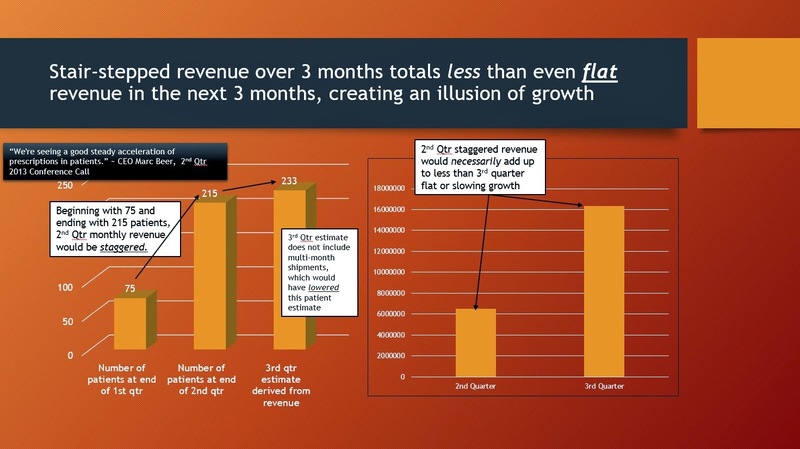 For example, if a company’s revenue grew steadily through the first three months of the year and then stopped growing … froze for the next three, the total revenue would still appear to grow on a quarterly basis. The numbers can be deceptive. The first quarter would total $6 in revenue (1 + 2 + 3); while the second quarter would total $9 (3 + 3 +3). That’s 50% growth from quarter to quarter, even though monthly revenue and the patient count have been flat for four months. If I showed my investors only the quarterly revenue, but not the monthly revenue and patient count, it might appear impressive. Aegerion’s CEO has been touting a population of 3,000 HoFH patients in the US. The lead scientist in Aegerion’s phase III study puts that number at 300. Now next to that serious red flag we have another: we cannot reconcile CEO Beer’s claim of an acceleration in patients on therapy with reported revenue. In fact it is difficult to account for any growth at all. I believe that investors have been misled about the "growth" in the number of patients on therapy. At this rate, it is extremely difficult to see how Aegerion can grow this company from an estimated 2013 revenue of $50 million to its current market cap of $2 billion dollars. For these reasons I believe that the average investor is at risk. · What was the third quarter count for patients on therapy? · Why stop providing this metric this quarter? Disclosure: After investigation, I believe that AEGR is grossly overvalued, that its addressable market has been exaggerated by 1,000%, and that its regulatory risks are not yet reflected in the stock price. Consequently, I am short AEGR. I am not infallible. All claims and references herein should be verified by the reader. All investors must do their own due diligence. This report is not a recommendation. There are two “levers” behind the diverse prevalence rates that are published for FH: Where one searches, and How one searches. Where one looks for FH patients will sometimes determine what prevalence rate one finds. 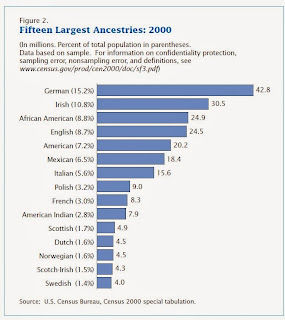 So we are showing a study for Northern Europe, while acknowledging a prevalence rate for 1:500 for the “general population.” And what do they mean by “a typical country in Northern Europe” when we read the source in greater detail that “all were whites of Danish descent”? How do we extrapolate from that restrictive sample to a general prevalence rate as promoted on Aegerion’s Investor Day? There is an interesting phenomenon known as the “founders effect,” where the prevalence rate of inherited traits, including genetic diseases, often increases or decreases out of proportion to the general population, as small groups move into isolation and then later grow their populations while still remaining relatively isolated. This means that certain isolated populations, Lebanese Christians, to cite a famous example, can have a much higher prevalence rate for HeFH and HoFH than the general population. Not all isolated groups have been studied for HoFH prevalence. Iceland and Finland however have been identified as cultures where “founders effect” is present. This is the source behind the European Heart Journal’s paper promoted on Aegerion’s Investor Day. What does this mean? Aegerion extrapolated data from “white Danish descendants” to estimate prevalence in the melting pot known as the USA. How one identifies FH patients determines what prevalence rate one will find. A single methodology used to identify HoFH or HeFH patients has not been established. In fact the study which Aegerion funded and was promoting on Investor Day, actually “proposes recommendations on how better to diagnose individuals and families with FH …” It recommends the Dutch Lipid Clinic Network Criteria (DLCN)-- a scoring system which categorizes cases as “Definite,” “Probable,” “Possible,” and “Unlikely.” It then lumps the Definite and Probable cases and shows a higher prevalence rate. By lumping “Probable” cases with “Definite” cases we will naturally arrive at a higher prevalence rate. A ‘definite FH’ diagnosis can be made if the subject scores .8 points. A ‘probable FH’ diagnosis can be made if the subject scores 6 to 8 points. A ‘possible FH’ diagnosis can be made if the subject scores 3 to 5 points. An ‘unlikely FH’ diagnosis can be made if the subject scores 0 to 2 points. Note the study included not only Definite FH patients, but also Probable. Should we be at all surprised that both studies received funds from players in the Pharmaceutical Industry who have a financial interest in finding a larger pool of HeFH patients? On the whole, the timing of the EAS consensus statement, which corresponds with the recent availability of these new drugs, might give some physicians reason to be skeptical. It wasn’t just a study of prevalence rates, it was the promotion of a particular method of screening patients. Most significantly, it was a scoring system that categorized FH candidates as Definite, Probable, Possible, and Unlikely. The data presented in the European Heart Journal lumped the Definite and Probable together, concluding a prevalence of 1:200. The original paper, from which the European paper derived its numbers, shows that the Definite FH patients concurs with the standard prevalence rate of 1:500. This is not to say that the study was falsified or is in error just because incentives are involved. That would be a failure in logic. It is only to say that of all the studies that could have been performed and presented, this particular group with this particular method was funded by the pharmaceutical industry and made available to us. The full debate between contrasting viewpoints has not yet taken place. At this point, anyone who does not break from the guided tour might be misled into thinking that a responsible conclusion has been made. Different incentives different selections, different presentations. This was Investor Day. Did we really expect balanced data and the inclusion of the conflicting studies of the HeFH prevalence? One Danish study suggests a prevalence of 1:950, another 1:200. It was Investor Day. Why would we see Aegerion’s funded study on the German population of FH patients next to that of the “white Danish descendants.” The German study, also funded by Aegerion, served its purpose: which was to show that HoFH was so rare that it deserved orphan status. Incentives? When in need of regulatory approval for an orphan product, one needs the number of patients to be as small as possible. After approval, when in need of promotional material for investors, one needs the patient population to be as large as possible. Before approval Dr. Cuchel who led Aegerion’s phase 3 study used 1:1,000,000. In the FDA committee meeting Dr. Rader, “inventor on Aegerion’s patent,” also uses 1:1,000,000. What some think should be done, does not have the same risk profile as What is already being done. Probability of social change versus the inertia of how things already are: Here’s another interesting contrast to these two papers which were both funded by Aegerion. The Danish study recommends that the medical community adopt a particular method. The German paper was a tally of existing patients, that is, it did not represent what Doctor’s should be doing but what in fact they are doing. As an investment, the probability that the pharmaceutical industry can change how doctors will screen for FH in the future is very different from the probability that doctors will continue doing what they are already doing. The German method is also more likely to have a real bearing on how many HoFH patients can actually be found. A theoretical scoring system working with a data base is going to find more “cases” than an empirical method of actually locating real patients. But Aegerion will not be selling lomitapide to tally marks in a research paper. It needs to find real people, through real doctors, and according to what those Doctors are in fact doing.